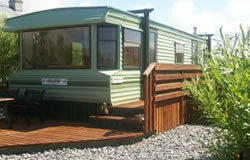 Our tastefully decorated fully equipped self-catering caravan Triuirebheinn has two bedrooms and sleeps four/six. It is furnished and equipped to a high standard with many luxury items including decked barbecue area with table and chairs, Sky TV, DVD, and CD players. Bed linen, towels and tea towels are included. Laundry service also available on request. Cots, high chairs, buggies and access to children's play area is available. Gas is provided and electricity is by £1 meter - but is very economical. The capital of South Uist, Lochboisdale, is a fishing port and fresh shellfish (which we can supply every day if you wish)from the crystal clear waters of the Atlantic and Minches are exported to restaurants and markets all over the world. Ferries operated by Caledonian MacBrayne sail to Oban and Castlebay from Lochboisdale on a daily basis. In Lochboisdale this end of the island provides a variety of shops, ranging from the local butcher and grocery shop, gift shop and internet cafe, post office, doctor and dentist surgery, filling station, garage, bank and local tourist office where local information guides are available. Situated overlooking a sea loch you can do a bit of seal spotting and other wildlife that inhabit the area. We are two miles from the beautiful white sandy beaches and the local Old Tom Morris golf course. There are a number of local activities on our doorstep in Lochboisdale such as salmon and trout fishing lochs, hill climbing, and bird and deer watching. Scuba diving, clay pigeon shooting and sea fishing is available on request. There is always plenty to do here! The nearest public house, Lochboisdale Hotel, is only five minutes walk away, which serves an extensive menu including some of the finest seafood available on the island. A superb base offering peace and tranquility with easy access for all your day trips.